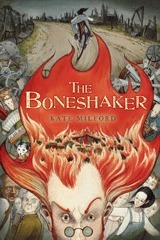 Kate Milford's The Boneshaker was one of my favorite books read in 2011. This one had a Something Wicked This Way Comes vibe. A small town set at the crossroads, an ominous traveling medicine show, a family legacy, deals with the Devil, and children having to face the fact that sometimes adults don't have all the answers. It was exciting, hopeful and bittersweet at the same time. It might be a middle school book, but nothing felt abbreviated as can sometimes happen. I love a book that respects the intelligence of its readers. Natalie is a phenomenal lead - smart, brave, but most importantly, even when she faced fantastical foes, she was completely natural. All of her reactions rang true. Also, and this is crucial for me in a kids book, the reasoning behind why the kids had to be the ones to save the day made perfect sense to me. Any book where I don't have to try too hard to suspend disbelief is high on my list. This week, the second book in the series was released and I couldn't be happier. 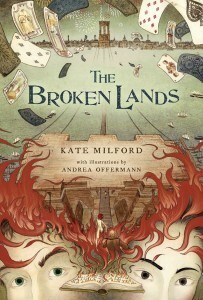 The Broken Lands is set before the events in The Boneshaker with new leads, but some familiar faces are here as well. Where book 1 is set in a small town, this one is set in NYC in a very urban crossroads. A certain someone (not going to say who) wants to take the city, and its up to Sam, a young card sharper, Jin, a girl with a flair for pyrotechnics, and their friends to stop them. I love how Milford wove the history of the place and people into the narrative. Again we have a cast of characters who felt so organic, with responses true to character. There is danger, problems to solve, people to find, and the clock is ticking. This is a series that I just lose myself in, and all of a sudden I've gone without sleep because I need to keep reading. The illustrations by Andrea Offermann are gorgeous and completely fitting with the story. These are books that I am saving for the kids alongside my Harry Potters. Beautifully written, smart, and stories with a lot of meat to them. I also enjoy the folklore treatment. It's familiar and yet I also haven't read many stories dealing with the crossroads, especially not ones for a younger audience, so it felt unique to me too. 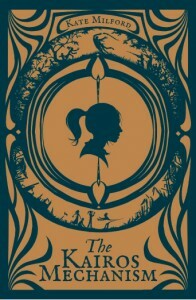 There is also a novella, The Kairos Mechanism, that links the events of the two books. It contains artwork by teen artists and will be released as both a paperback and an eBook. Go here for more info on the project and how to get it. I haven't read it yet, but you better believe I'm going to be reading it soon!